I hear that National is planning something quite radical for next year’s Auckland’s local body elections. There are plans for a new regional vehicle, Future Auckland, to contest various elections in the super city. The reason for the change is that National understand how important Auckland is to the future of the country and it does not want to leave things to chance and the vagaries of local elections. Michelle Boag is apparently involved as is former National Cabinet Minister Paul East. There is talk about there being a formal MOU with the National party. If so National aligned C&R’s stated reason for being, to keep central party politics out of local government will be no more. The intention must be that C&R will be folded into the new organisation. It is a somewhat radical change for National. Previously the party’s view was that it did not get involved in local body politics and used proxies to campaign instead. But it appears that C&R has not been asked what it thinks about the proposal (donotlink to Whaleoil). It sounded far fetched but there is this evidence, former National Minister Paul East is competing in the local AECT elections and standing against the C&R ticket which currently control the trust. His presence and his obvious National Party roots will hurt their campaign. One of the C&R candidates is former National MP Paul Hutchison. National Party conferences must be fun events right now. Bill Ralston is a likely candidate. And there is talk of Cameron Brewer standing down and being replaced in the Orakei ward by Desley Simpson, partner of National Party president Peter Goodfellow. Christine Fletcher would be unmovable in Eden Albert and George Wood would be safe in North Shore. But Denise Krum could find it difficult in Maungakiekie unless she swaps over and Linda Cooper’s antagonistic relationship with Michelle Boag could prove problematic to her in West Auckland. Bill Cashmere should be safe in Franklin. But Callum Penrose should be vulnerable if a proper campaign is run against him in Manurewa-Papakura. The organisation will no doubt be well financed despite Slater’s claims to the contrary. What will be interesting to find out is what C&R think about the proposal and how they feel about being unceremoniously taken over. And what Judith Collins thinks of all of this. If true, the consequences are significant for how the country could be governed. Firstly, it’s an overt sanction of caucusing in local government on an unprecedented scale. We haven’t had much party political division before, but it would immediately turn Council meetings into whipped and party-orchestrated events, like Parliament. Secondly, the potential for strong policy orchestration between central and local government would be very strong. 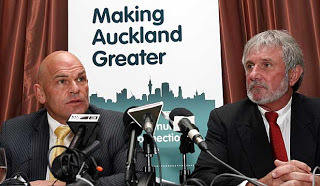 Local government in Auckland would no longer be a check and balance to the excesses of central government – who are exceedingly clumsy when seeking to run cities. Witness Christchurch. I hope City Vision force the same kind of pre-2017 coalition discussion. If they don’t bridge this gulf as National appears to be, central and local government will be much harder to attain for the current Opposition. In terms of politics, it will be difficult for PM Key, because the Boag+Auckland players+National Party President alliance essentially tilts towards Collins and her rag-tag battlefleet of hasbeens and never-were’s. That makes Key’s own succession planning difficult, and also difficult for Bennett to have a tilt (with English or Joyce well past their prime, and talented blood like Bridges far too unsalted). Let’s see how this plays, but interesting intel Mickey. I don’t think the plan will work out west or in the south. Feelings are pretty negative about super city and the focus on the centre and I think that well placed local campaigns have the greatest chance of success. It may work in the North where a majority of councillors are remarkably liberal for the areas they represent. It is hard to read this as anything other than another round in the bitter civil war within the Auckland National party. Like Tea Party vs. RINO. Imagine, if you will, a fight between the monster raving loonies of the C&R aligned Auckland Nats (the likes of Carrick Graham, Brewer, Slater, Collins, Quax, etc) and their bitter enemies NINOs (National in name only) like Boag and Ralston and the rest of the “respectable” (where “respectable” is people who don’t spend their time in the papers associated with salacious scandals and defamation cases) Auckland right wing establishment. Seen in that light, a power play by Boag to out-manoeuvre the C&Rs and replace them all with a more electable slate of muppets like Ralston almost makes sense. No – I think it may be more than that, Sanctuary. Auckland SuperCity has not gone quite as Hide and the Nats wanted. This will be an attempt to take it over completely and finish the job. I think Jenny Kirk is correct. It’s part of the overall long-term plan to take over Auckland and the rest of the country on a permanent basis. Rodney Hide’s attempt didn’t pan out as planned so they’re trying again. It’s detestable. Mind you it does involve power play too and I have to wonder which side Hooten will be supporting. Which seat does Brewer get in the 2017 election as compensation? Probably Rimmers or they’ll elbow O’Connor out of ‘safe as houses’ Tamaki but if they want the banksy clone to work for it Sneaky sammy’s time could be up in Mangakiekie to make way. So brewer will stand for Act or National, depending on who can be adequately compensated to stand aside for him? Agreed Tracey, there has to be some quid pro quo for that loyal National boy! Sam is a disaster and a lightweight in a sea of heavy weight pond scum. “The reason for the change is that National…….” see so many opportunities to exploit Auckland and asset sales springs immediately to mind. It is not at all hard to imagine that being at the right place with the right inside knowledge at the right time will see an individual very wealthy, very quickly. It was supposed to happen with John Banks, only he was wisely avoided by voters. Add to the mix the likes of the murky Tamaki Redevelopment Co that has got it’s greedy hands all over vast swaithes of state housing land and buildings out east and make that the Mt Roskill or the Sandringham or put whatever name you like “Redevelopment Co”, where prime land has state housing attached, and there is a gold rush like bonanza to be had. That the extreme/obscene wealth of the National Party are eyeing this one up means worrying times for the rest of us. Whatever their publically stated agenda is will be as far from the truth as it possibly can be! co-owned by council and govt. there are far ‘murkier’ entities than that one. Anything that throws state housing tenants out somewhere else so the developers can go in is murky. Start Googling some of the names and the National Party turns up again and again. It is far from transparent what is going on and who is making what but it is appalling to see so many families displaced by this “project” and so many boarded up homes going begging while people struggle to make ends meet! Has anyone been keeping tabs on how much of the GI land has gone from housing corp to private hands in the nact state housing shell game ?